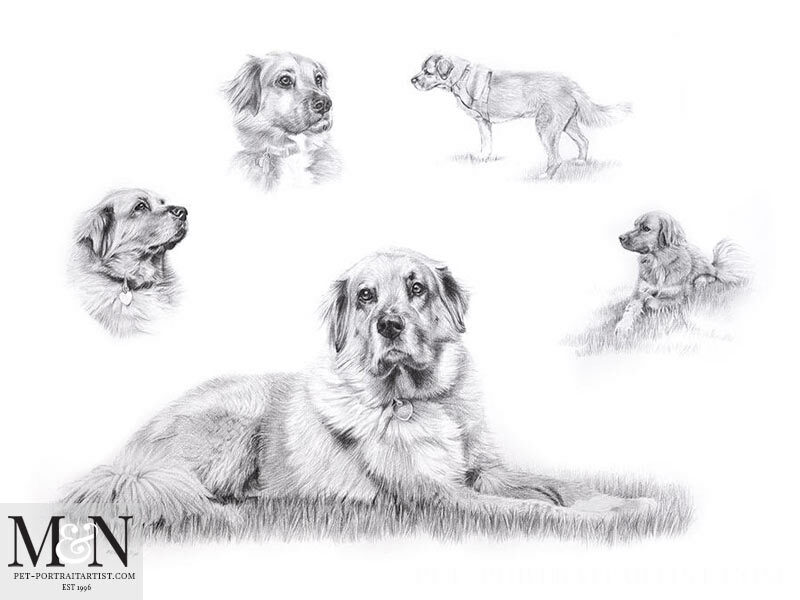 Welcome to my first drawing of the year, a pencil pet portrait montage of Mikey. 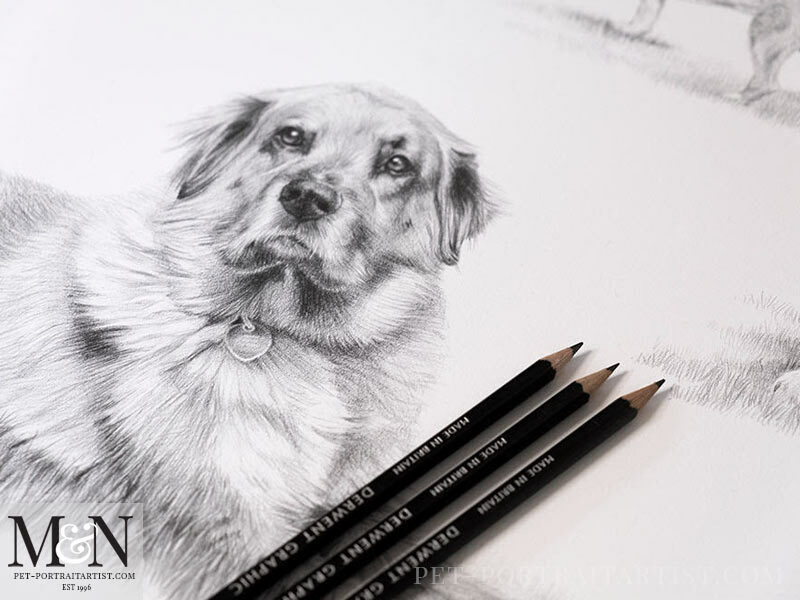 A lovely client in the USA commissioned the portrait of Mikey. 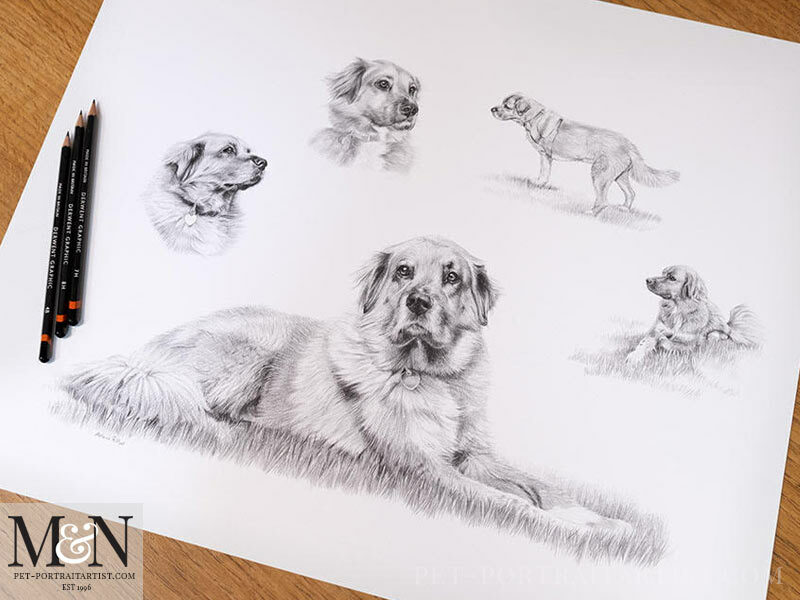 Sadly Mikey passed away last year and so he felt that this Pencil Pet Portrait Montage be a wonderful reminder of Mikey for all of his family. Russell emailed lots of lovely photos of Mikey and requested a montage portrait. Between us we chose three photos for the smaller studies and one larger full body photo for the main study. As a result, they all work really well together as you can see from the final photo below. 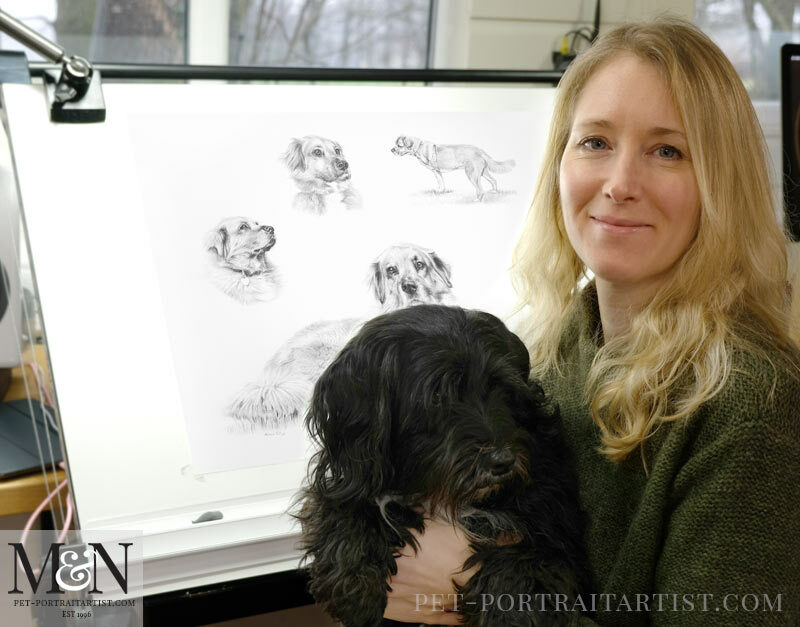 Nicholas took a couple of photos of me while I was working on the drawing, along with one where Lily our dog was sitting on my lap. However, having said that I don’t draw with her on my lap! She was just visiting for cuddles! Quite spectacular Melanie. You have captured Mikey’s personality and he was a very gentle, loving boy. I am delighted with the images you have sent, please go ahead and frame. Can’t wait now. Did I mention I can’t wait, yep I did. Thanks Melanie you are truly talented. Here are a few candid photos of the portrait on my plan chest in the studio. Capturing the portraits from an angle with my pencils helps to give scale to the drawing. Scroll down to read more about the frame and see photos. 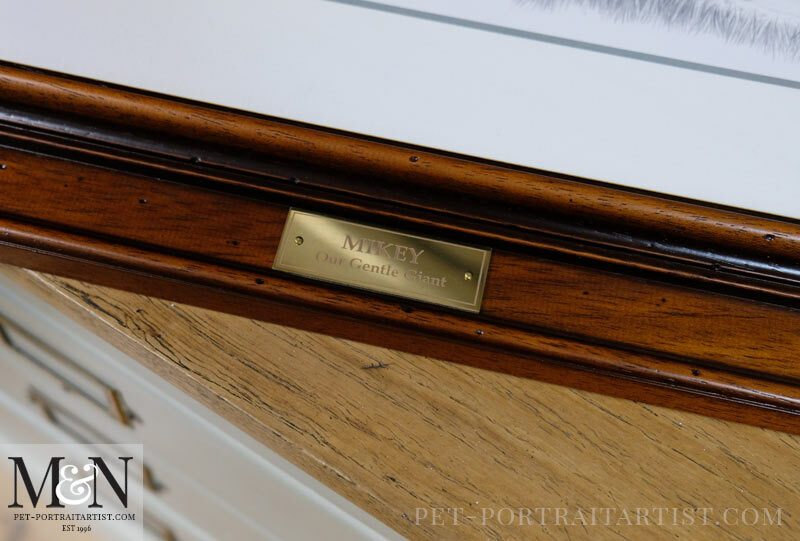 In addition to the drawing, engraved plaques are a perfect way to complete my portraits. They are amazing and clients can have as much text as they require. 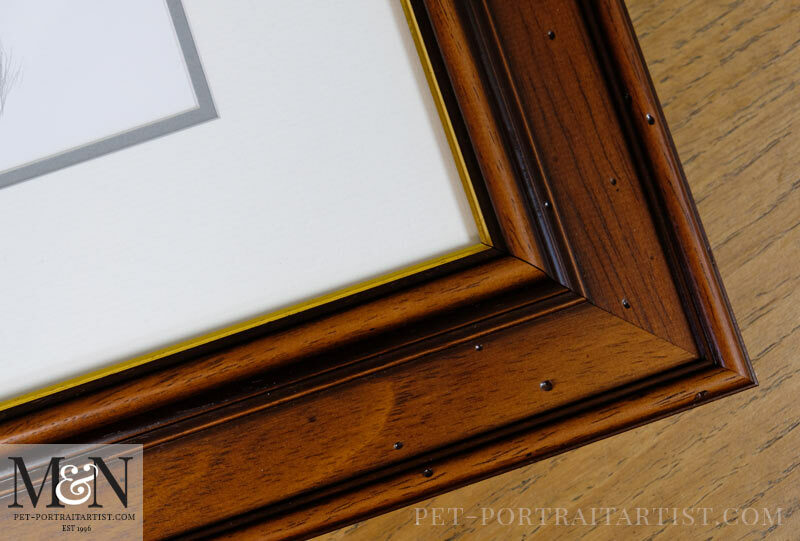 Most of our frames work with the plaques, although it is a consideration when choosing the frame. 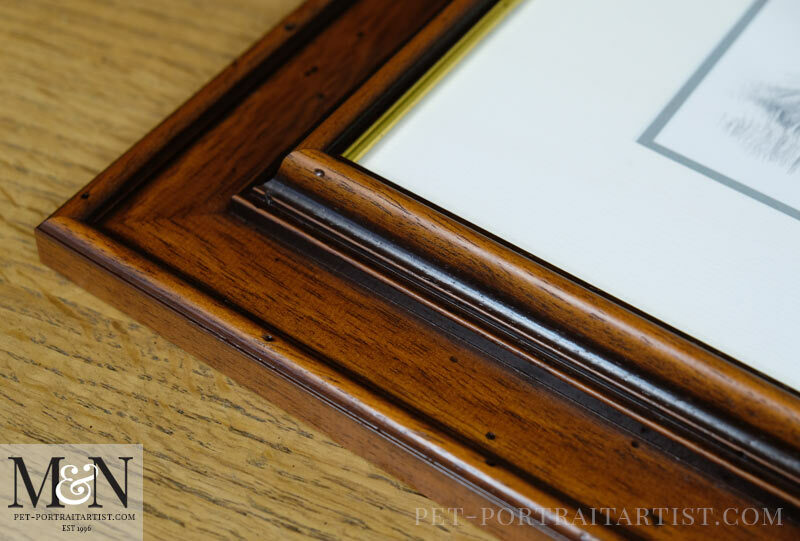 Consequently, our traditional Flat frame works beautifully with them. Plaques come in two different colours, silver or bronze. Similarly, with a with a mirrored surface or a brushed steel. 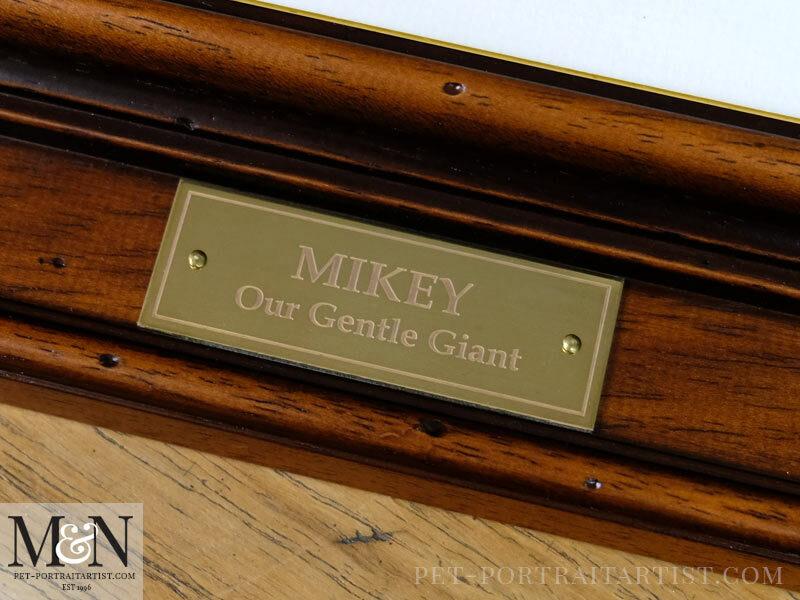 Mikey’s is a bronze mirrored plaque which matches beautifully with the frame. In addition I have added some of the framed portrait below. 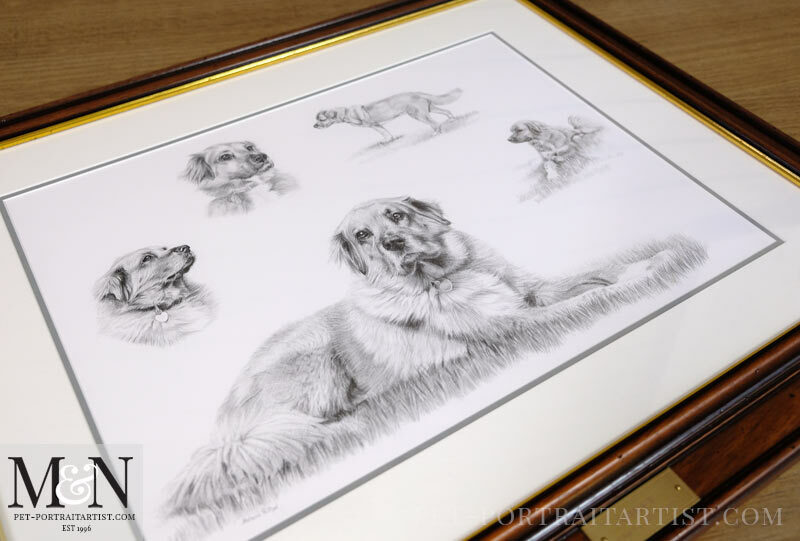 Our framer has created a double mount with an inner colour of a pale grey which matches well with the graphite drawing. The top mount is ‘Hayseed’ in colour which is slightly textured and a very pale cream. 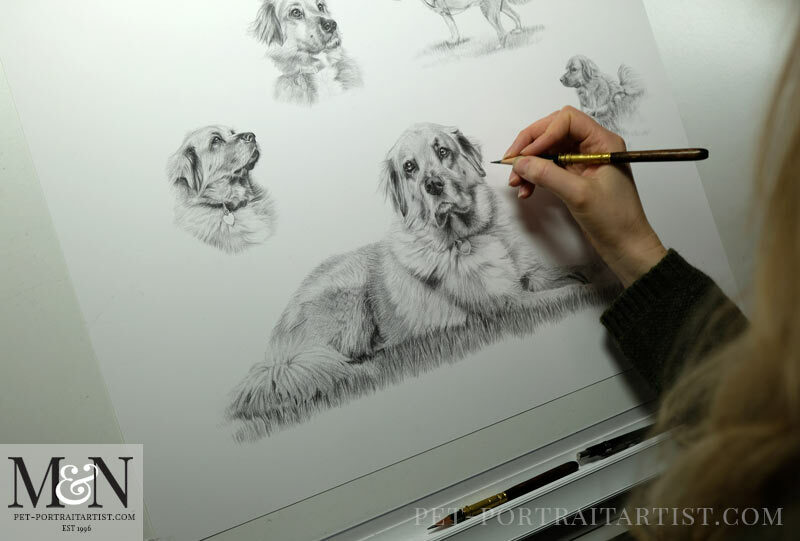 All beautifully natural therefore, allowing the drawing to take centre stage. 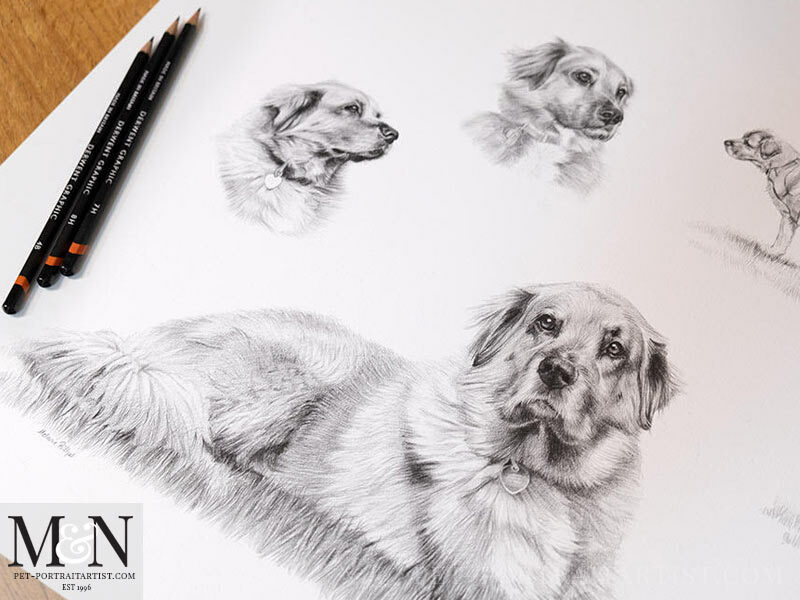 Finally, if you would like the Traditional Flat frame, or you would like a montage drawing of your dog, please don’t hesitate to email me at any time from my pet portraits contact page. Take a look at my ordering page overview too! Above all you can contact me via my website on the contact page.